Official image of the world's first four-camera phone leaks, now where's the monochrome, Samsung? 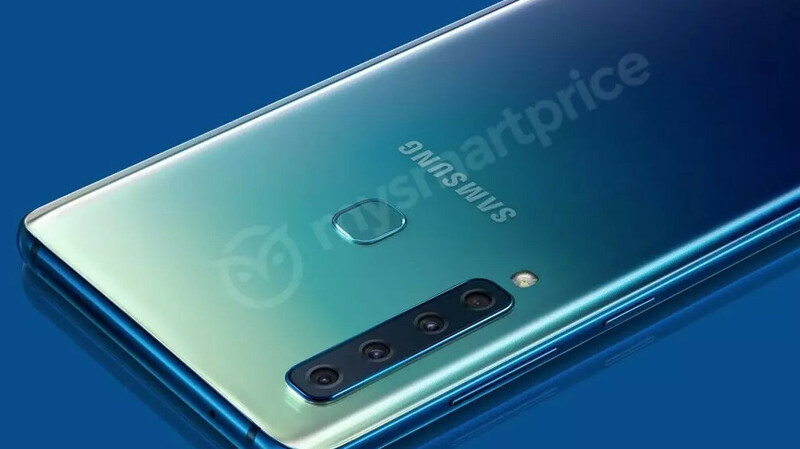 The Galaxy A9s is shaping up to be the world's first with four cameras. After years of skipping the dual-camera trend, Samsung will apparently go straight ahead of the pack by packing all Four Horsemen of sensor/lens combos that others have been using, into one single device. The top shelf of the vertical quadro-camera placement is reserved for the 8MP Ultra Wide-angle camera with f/2.4 aperture and a 120 degrees field of view. Immediately after comes the 2x zoom telephoto camera with 10MP resolution and the same aperture. A 24MP main sensor will take care of the low-light shots with a wider, f/1.7 aperture, while below the deck is the 5MP sensor for extra depth measurement for those Live Focus and portrait shots. That leaves nothing for the brand that will first introduce a penta-camera phone, unless it slaps an extra monochrome sensor there as well. Shhht, we'll stop giving them ideas now, but can't wait to test what is shaping up to be the most versatile camera setup after the one on the LG V40. It should be a great phone at the time it launch, Btw, I think Nokia 9 will come with these type of camera's plus monochrome at rear. It looks ugly AF! LMAO! Do you not have eyes in your head to see how ugly this thing is? I mean, just make the whole back of the phone a big @$$ camera lense. I guess I should put all of my moment lenses on eBay before the launch. Lol. Right? Those dang things cost the same combined as buying a phone. What a nonsense. I am pretty sure this will be the reason to justy price hike in the midrange segment. Most likely waste of hardware. Not needed Why not just work on the two cameras they use now. Don't want monochrome a good camera will do good in low light without it. I'd rather have one excellent camera instead of 3 or 4 so so ones. Daniel, what do you mean they skipped the dual camera trend. My 2017 Note has 2 back cameras. It doesn't say that Samsung skipped the dual camera trend. It merely says that Samsung avoided the dual camera trend for several years. Lens could have been in different pattern. This one is looking like traffic signal. Innovation at its finest by Crapsung. Shove more camera's in the phone until Apple release something truly innovative and then copy them! Well done Samsung, start those photocopiers!